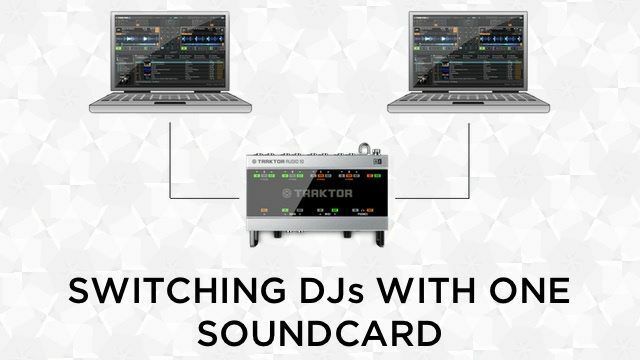 One of the challenges for Traktor and Serato DJs sharing the same soundcard is seamlessly transitioning between laptops with only one soundcard or mixer. This isn’t an issue for DJs that use CDJs or Rekordbox since the other DJ can mix in on the other player. Ean Golden has a simple trick that makes switching between DJs on 1 soundcard super easy using the Roll effect commonly found on club mixers like the Pioneer DJM 900. Club mixers, such as the Pioneer DJM 800 or DJM 900, have a built-in FX section with a variety of selectable FX. The effect that we’ll be using is the Roll/Beat Roll effect, which is very similar to Traktor’s Beatmasher effect. The Roll effect can be used to create little glitches or loop rolls to throw into a mix. However this effect has a more utilitarian use that can help transition between DJs that need to share the same soundcard. By setting a high beat/loop count (8/1, 4/1) DJs can create a seamless loop that’s playing right inside the mixer. This loop will continue to play until the Roll effect is turned off. Once the loop is set, the current DJ can unplug from the mixer or soundcard and the loop roll will continue to play from the mixer. This allows the other DJ to plug their laptop into the soundcard or mixer and mix out of the beat roll loop without any interruptions in the music. There’s a lot of other important things to consider when switching DJs, be sure to know “basic DJ etiquette”. If the transition is taking too long, the loop can start to sound really repetitive. DJs can apply FX overtop the loop such as the color FX of the DJM 800/900 to add some flavour to it. Another cool trick that can be used for transitions is shortening the loop roll length and applying color FX (such as echo) to create a dramatic build out. Looking for more ways to transition between DJs?